Arriving to work at 10:40am is a luxury. My tired body needed a good rest and I needed to recharge my mind with some new menu ideas. After finishing a little cleanup from the previous day, I find out that the clients will be entertaining for both lunch and dinner today. Luckily, I have two chicken breasts in the fridge that will be perfect for a lunch for four. Mrs. compliments me on the previous days’ cheese pies, but reminds me gently that Mr. cannot make a habit of such decadence, lest he balloon up like a blimp. My lunch today will be much lighter to ease her worries. 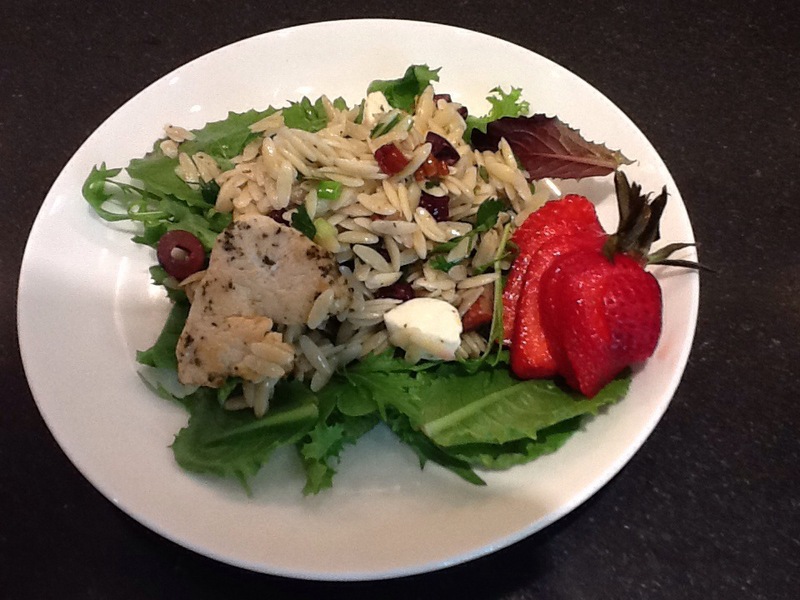 Orzo salad with cranberries, pecans, scallions, Kalamata olives, parsley and lemon zest dressed ever so lightly with a lemony olive oil vinaigrette over mixed baby greens is circled with medallions of chicken breast marinated with basil, oregano, lemon, salt and pepper. Hello spring! Clients head out for a couple hours after reminding me that they have a lot of leftovers in the fridge that need to be used up. I survey the leftovers, pasta, pasta, gumbo. 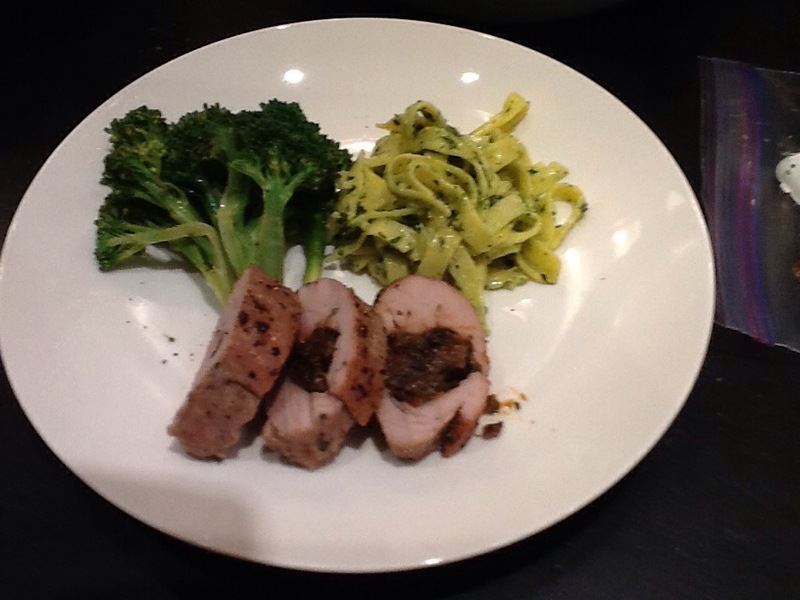 I am planning a stuffed pork tenderloin for dinner. I decide to take up my employer’s challenge! I will repurpose the fettucini Alfredo by lightening it up with a lemon-pepper-parsley pesto. That will be my dinner starch. Steamed broccoli with olive oil and lemon and a lightly dressed side salad will round out the meal. I stuff the tenderloin with a mixture of chopped prunes, port wine, Dijon mustard and parsley. 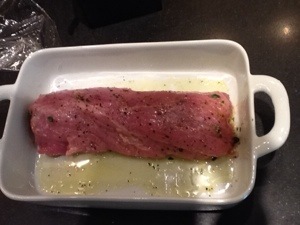 It is seasoned with salt and pepper, dressed with olive oil and set aside for one hour in the fridge. The pork is cooked at 375° in a convection oven for 50 minutes. After resting for ten minutes it is ready to slice and plate. It is moist and juicy and the accompanying herbaceous and lemony fettucini complements it nicely. Next Next post: On the third day…blow them away!